CARFAX Certified 1 Owner - No Accidents - Fully Serviced - Quality Certified W/up to 10 Years, 100,000 miles Warranty This Lexus includes: INTUITIVE PARKING ASSIST Rear Parking Aid COMFORT PACKAGE Heated Rear Seat(s) Cooled Front Seat(s) A/C Heated Front Seat(s) Rear A/C Bucket Seats MAHOGANY WOOD Leather Steering Wheel PREMIUM PACKAGE Fog Lamps Heated Rear Seat(s) Variable Speed Intermittent Wipers Cooled Front Seat(s) Aluminum Wheels Navigation System A/C Intermittent Wipers Rear Parking Aid Back-Up Camera Heated Front Seat(s) Bluetooth Connection Rear A/C Telematics Rain Sensing Wipers Bucket Seats *Note - For third party subscriptions or services, please contact the dealer for more information. * CARFAX shows that this is a one-owner vehicle -- no wonder it's in such great condition. This SUV is a superb example of what a tough, work focused vehicle should be. Exceptional towing, acceleration and torque will help you get the job done. You appreciate the finer things in life, the vehicle you drive should not be the exception. Style, performance, sophistication is in a class of its own with this stunning Lexus GX 460 - CARFAX Certified 1 Owner - No Accidents - Fully Serviced - Quality Certified W/up to 10 Years, 100,000 miles Warranty. Want to brave the road less traveled? You'll have the 4WD capabilities to do it with this vehicle. Find the quickest driving route in this Lexus GX 460 - CARFAX Certified 1 Owner - No Accidents - Fully Serviced - Quality Certified W/up to 10 Years, 100,000 miles Warranty using the installed navigation system. This nav system is one of the easiest to use and will help get you where you need to go quickly! Feel at ease with your purchase of this Lexus GX 460 - CARFAX Certified 1 Owner - No Accidents - Fully Serviced - Quality Certified W/up to 10 Years, 100,000 miles Warranty , all records are included allowing you to truly know what you're buying. Looking for a Lexus GX 460 - CARFAX Certified 1 Owner - No Accidents - Fully Serviced - Quality Certified W/up to 10 Years, 100,000 miles Warranty that is in great condition inside and out? Take a look at this beauty. Well-equipped, well-cared for and still covered under the manufacter's factory warranty. The incredible 2016 Lexus GX 460 - CARFAX Certified 1 Owner - No Accidents - Fully Serviced - Quality Certified W/up to 10 Years, 100,000 miles Warranty is an invigorating performance machine that will pump adrenaline into any driver who dares to take the wheel. Do you really need any other reason to want one? 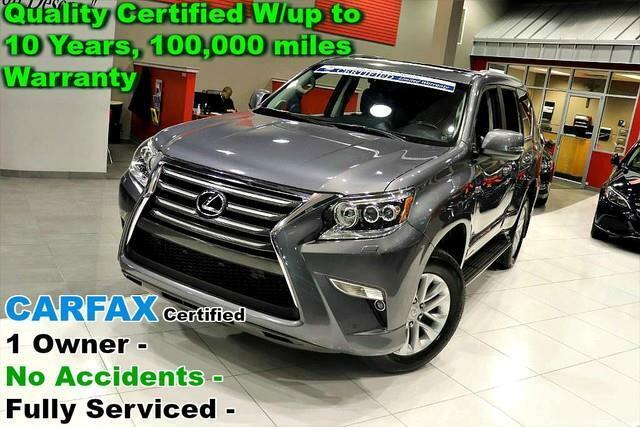 The Lexus GX 460 - CARFAX Certified 1 Owner - No Accidents - Fully Serviced - Quality Certified W/up to 10 Years, 100,000 miles Warranty is in a class on its own. So much so, that Lexus didn't miss a beat when they loaded this vehicle with an abundance of a-la-carte options. Added comfort with contemporary style is the leather interior to heighten the quality and craftsmanship for the Lexus GX 460 - CARFAX Certified 1 Owner - No Accidents - Fully Serviced - Quality Certified W/up to 10 Years, 100,000 miles Warranty This car has an exceptional paint finish that shows no sign of age or wear. Unique and nearly impossible to find, this 2016 Lexus GX 460 - CARFAX Certified 1 Owner - No Accidents - Fully Serviced - Quality Certified W/up to 10 Years, 100,000 miles Warranty is a collector's dream come true. More information about the 2016 Lexus GX 460 - CARFAX Certified 1 Owner - No Accidents - Fully Serviced - Quality Certified W/up to 10 Years, 100,000 miles Warranty: The GX 460 is more like a truck than a car-like crossover utility vehicle. It's closely related to the Toyota 4Runner -- so it has body-on-frame construction, an asset for anyone who tows regularly. The GX otherwise stands out for being especially well-equipped with both luxury-car comforts as well as useful off-road aids and safety-tech features. It might also prove more maneuverable and manageable versus a full-size luxury SUV such as a Cadillac Escalade or Lincoln Navigator. Interesting features of this model are comfortable seating, Rugged body-on-frame construction, towing ability, available tech and safety features, luxurious interior, and strong powertrain No Credit / Bad Credit / No Paystubs, No problem !! ! All Approved ! Everyone drives ! CLEAN, GORGEOUS, LOW MILES, SHOWROOM CONDITION. CALL NOW QUALITY CERTIFIED up to 10 YEARS 100,000 MILE WARRANTY , To Certify a vehicle, there will be an additional cost for Certification. CALL NOW For details. STUNNING AGGRESSIVE LOOK ON THIS BEAUTIFUL--Call today to schedule a test drive... Good Credit/Bad Credit/No problem!!!! Get paid cash? No problem!! 100% Credit Approval with interest rates starting at 2.49% for qualified customers, our rates will not be beaten. We price our cars at wholesale price to guarantee the best deals for our customers. Our inventory moves quick, please call to confirm the availability of the vehicle of your interest Springfield location 973-564-0112. This vehicle is located at our SPRINGFIELD location. Come visit our new showroom in Springfield NJ. Contact Quality Auto Center today for information on dozens of vehicles like this 2016 Lexus GX 460 . This Lexus GX 460 offers all the comforts of a well-optioned sedan with the utility you demand from an SUV. The Lexus GX 460 's pristine good looks were combined with the Lexus high standard of excellence in order to make this a unique find. Tackle any terrain with this 4WD Lexus GX 460 . Off the road or on the parkway, you'll drive with confidence no matter the weather conditions or landscape. More information about the 2016 Lexus GX 460: The GX 460 is more like a truck than a car-like crossover utility vehicle. It's closely related to the Toyota 4Runner -- so it has body-on-frame construction, an asset for anyone who tows regularly. The GX otherwise stands out for being especially well-equipped with both luxury-car comforts as well as useful off-road aids and safety-tech features. It might also prove more maneuverable and manageable versus a full-size luxury SUV such as a Cadillac Escalade or Lincoln Navigator. Strengths of this model include comfortable seating, Rugged body-on-frame construction, towing ability, available tech and safety features, luxurious interior, and strong powertrain No Credit / Bad Credit / No Paystubs, No problem !! ! All Approved ! Everyone drives ! CLEAN, GORGEOUS, LOW MILES, SHOWROOM CONDITION. CALL NOW QUALITY CERTIFIED up to 10 YEARS 100,000 MILE WARRANTY , To Certify a vehicle, there will be an additional cost for Certification. CALL NOW For details. STUNNING AGGRESSIVE LOOK ON THIS BEAUTIFUL--Call today to schedule a test drive... Good Credit/Bad Credit/No problem!!!! Get paid cash? No problem!! 100% Credit Approval with interest rates starting at 2.49% for qualified customers, our rates will not be beaten. We price our cars at wholesale price to guarantee the best deals for our customers. Our inventory moves quick, please call to confirm the availability of the vehicle of your interest Springfield location 973-564-0112. This vehicle is located at our SPRINGFIELD location. Come visit our new showroom in Springfield NJ.